Quinotto is the quinoa equivalent of risotto. Since risotto is one of my favorite foods, I thought I would give this a try. It turned out to be delicious and the roasted squash gave this dish a wonderful flavor… nothing beats out risotto, but this is a close second! Preheat oven to 350°F. Place the butternut squash on a baking sheet. Drizzle with 1 Tablespoon olive oil and season with salt & pepper and about 1 Tablespoon cilantro. Toss to combine. Roast in oven for 30 minutes, or until tender and lightly browned. Cook the quinoa. A rice cooker works well or you can cook it on the stovetop. Add the quinoa along with 1 cup of water to a saucepan, bring to a boil, reduce heat and simmer for about 20 minutes or until the liquid is absorbed. For a rice cooker, add the quinoa along with 1 cup water and turn on. Heat the remaining 1 Tablespoon of olive oil to a sauté pan over medium high heat. Add the garlic and onion, cooking for a couple minutes to soften the onion. Add the mushrooms, remaining cilantro and 1/2 cup stock. Cover and simmer for about 5-7 minutes, or until the liquid is absorbed. 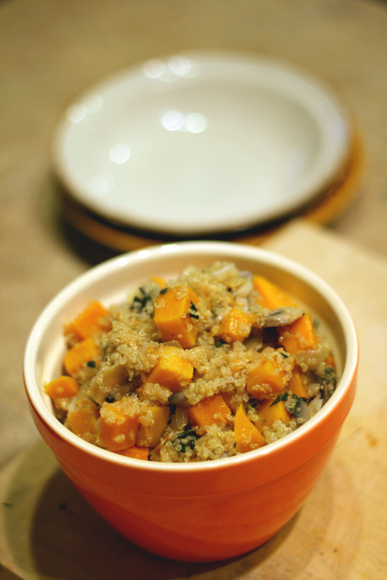 Mix the grated carrot into the cooked quinoa. Stir the quinoa and remaining stock into the veggies in the sauté pan. Fold in the squash. Cover and simmer a few more minutes to let the remaining liquid absorb.